Under $2.25 per serving.A mesquite-marinated chicken breast is grilled then topped with melted cheese, bacon and all the trimmings -- it's a feast on a bun! 1. Mix Marinade Mix, lime juice, honey and oil in small bowl. Place chicken in large resealable plastic bag or glass dish. Add marinade; turn to coat well. 3. Grill over medium heat 6 to 7 minutes per side or until chicken is cooked through, turning frequently. 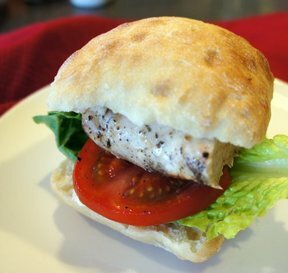 Serve chicken on toasted rolls with lettuce and tomatoes. Top with bacon, cheese and condiments, if desired. Prepare as directed, using McCormick® Grill Mates® Zesty Herb or Baja Citrus Marinade in place of the Mesquite Marinade. Try the sandwich with Swiss cheese and ham instead of American cheese and bacon.